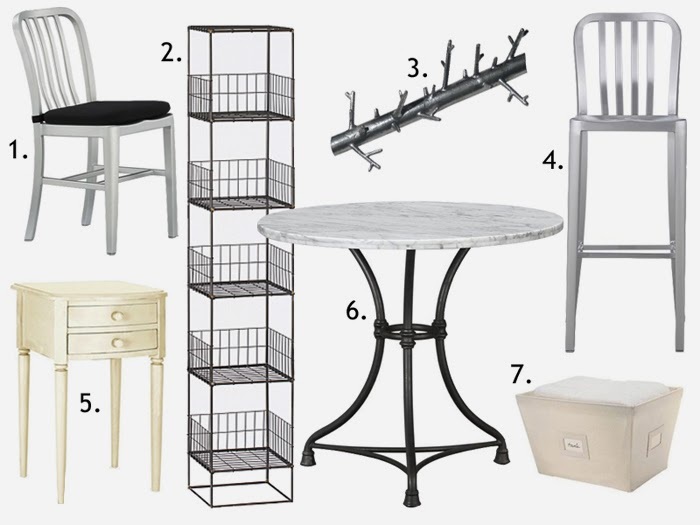 In January, I shared a little bit about our apartment makeover in a post featuring some of what the BF and I purchased. However, I never finished going over the remaining pieces we bought. Some of my favorite furniture is in the collage above - I can't wait to share more about where the furniture is from, and why we bought these pieces. 1. Crate and Barrel: These chairs are so sleek I couldn't pass them up. To make them a little more comfortable we also purchased seat cushions. Now we can dine in style and comfort. 2. CB2: The key to maintaining a great NYC apartment is lots of storage. This set of shelves has been a life saver. We currently use it in our bathroom to house everything from towels to hair straighteners. 3. The Container Store: I bought two of these silver branches after reading about them in a magazine. I use them to hang my necklaces. The branches are really ingenious as they're also great wall art. 4. Crate and Barrel: We have a bar - not to brag. When we first toured the apartment I envisioned eating breakfast at the bar on weekends. Instead, we use it to house the BF's coats. However, any bar, no matter what it's used for, needs bar stools. 5. Pottery Barn: When we moved into this larger apartment, I brought some furniture from my childhood home, including a vintage looking wardrobe for our bedroom. In order to maintain a consistent color palette, I found bedside tables that matched the color of the wardrobe perfectly. They also miraculously have the same distressed look as the wardrobe. 6. Crate and Barrel: This marble table is everything. I feel like I'm eating at a bistro every time I sit down at our kitchen table. 7. The Container Store: This was a storage idea gone wrong. The boxes ended up being a different size than I wanted. As a result, they went back to the store ASAP. That table is excruciatingly gorgeous, your taste is impeccable. @harris - thank you so much!